Contemporary and Impressionistic Fine Art - ACEO Cards - Photography - Originals and Limited Editions. Portrait Photography Services available in West Michigan Region for High School Seniors, Adults, Children, Families and Pets. 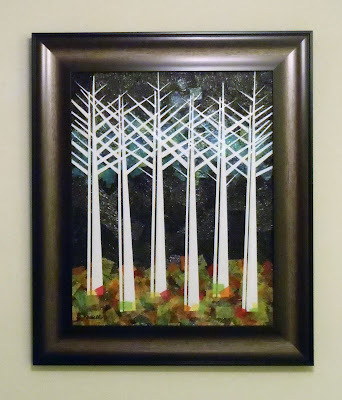 Artwork was inspired from a photograph taken of a row of trees that lined the lake shore. 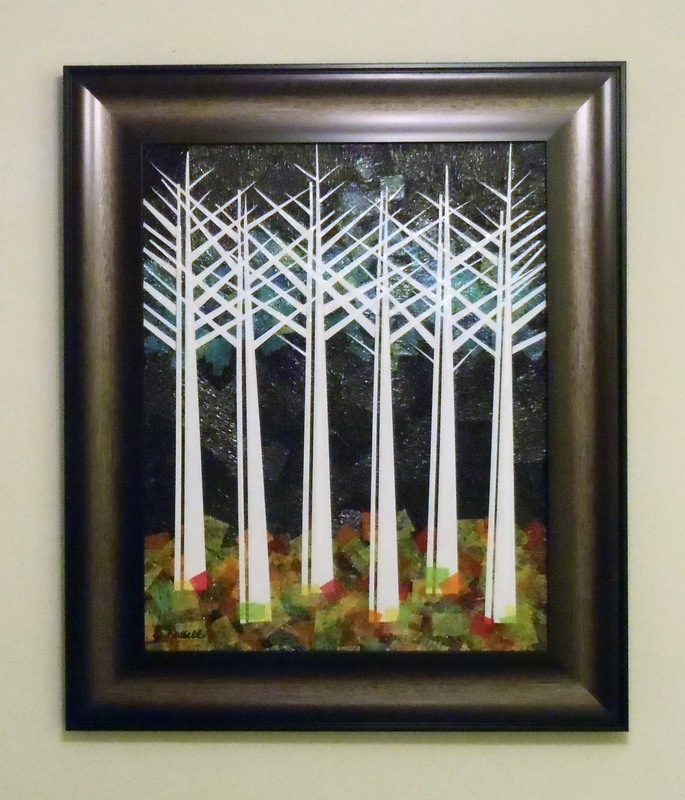 This 21"x25" framed piece was created on canvas by using multiple layers of vibrant colored tissue papers and acid free glue are placed on a canvas and then sealed with a UV resistant coating. The tissue paper layers often appear transparent and provide a natural motion and display a spectacular array of colors when viewed. MMCA has a very distinct look and will surely generate interest and conversation by viewers when displayed. Sherri has spent many years experimenting with materials and solvents on prototype samples to ensure the tissue colors stay true. Thank you for visiting my on-line gallery. My interest in mixed media collage art started very early. As a child I preferred making things and drawing pictures instead of playing sports and building forts. I chuckle when thinking back to the age of 7 when I planned my first big art project. I got busy cutting large tree branches into 1” slices with a hand saw so I could glue on pictures from used greeting cards, seal with Elmer’s glue, top with sprinkles and a attach hook to hang…only to then box them up to display and sell them on the neighborhood street corner for $1 each. I think I must have sold over 50 of them that summer.I can assure you that my talents have greatly improved since childhood. I have moved on to more desirable mediums as an adult and experienced artist that you will be sure to love…and no worries folks, I save my used greeting cards for the recycler now. 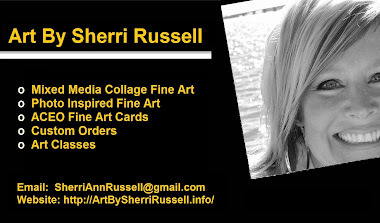 Fine Art by Sherri Russell. Picture Window theme. Powered by Blogger.